Now includes the latest deck list and a huge amount of strategy advice. 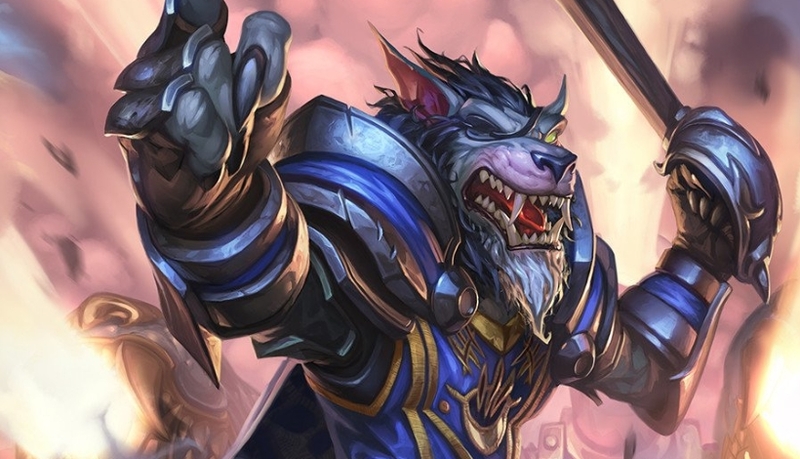 Our Rush Warrior deck list guide features the best Rise of Shadows deck list for Season 61 of Hearthstone (April 2019). Our Rush Warrior guide also contains Mulligan advice, card combos and strategy tips. Rush Warrior is a Hearthstone deck archetype that was hyped a huge amount by Blizzard in the build up to the launch of The Witchwood expansion, but it never really gained much traction after that. With the Rastakhan’s Rumble set, however, it appears to be getting a few additional tools that could help it find a more stable place in the meta, while building on the core foundation of good old Tempo Warrior to provide tonnes of value at every stage of the game. If the keyword has passed you by, Rush cards are able to attack other minions on the turn they're put into play, but not the enemy hero. That provides the Rush Warrior player with a huge amount of initiative, particularly in the early game, but without creating the kind of balance issues that have been historically associated with Charge. Suffice to say you should have lots of answers to your opponent's plays at each stage of the game. In this latest update to our Rush Warrior guide, we’ve highlighted the best deck list for the archetype right now. We've also got detailed strategy advice and Mulligan tips after that, followed by a breakdown of all the big combos this deck contains. All aspects of this guide will be expanded upon further in the months ahead as well! Trump reckons a Bomb-infused Rush Warrior is likely to be part of the upcoming meta, and so we're highlighting that deck list right here. Everything below this point refers to a pre-launch version of Rush Warrior! We'll overhaul all of our deck guides completely once things have settled down. Rush Warrior is a minion heavy deck that relies on high tempo plays to eke out small advantages over its opponents over the course of a game. Early game: You’ll be looking to establish a board presence with your early game minions as soon as possible. Town Crier and Eternium Rover are great options in this regard. If you’re able to slam down Prince Keleseth on turn two you will be beyond happy and well-positioned for the rest of the match. Mid game: Continue playing your minions and looking for efficient trades with your opponent’s. If your minions have stuck around you’ll be putting on so much pressure from the early stages that the game might already be falling away from them if they’re unable to find a board clear. Even more Rush and Charge minions are available now, including big-hitters like Darius Crowley and Zilliax to help you keep things in check as your opponent tries to play through their hand. Late game: As you approach the late game, you've more fuel in the form of some of the big minions that populate the bottom end of the deck list. Countess Ashmore in particular is terrific if your hand is running thin at this stage - she can draw you up to three cards depending on what’s left in the deck. If all has gone well in the early and mid game you should be in a dominant board position by now and ready to secure the win. Rush Warrior has many powerful finishing moves, most notably a damaged Grommash Hellscream swinging in for ten damage. You can activate him with cards like Blood Razor, or with the new hero power from Scourgelord Garrosh. Other big minions that can help seal your victory include The Lich King and Akali, the Rhino – or the Rush minion the latter one buffs. 1. With your army of Rush minions you should be able to keep their side of the board clear without too much of an issue. 2. The deck runs no area of effect spells, so your best bet for a emergency board clear is the one damage whirlwind effect on Blood Razor. 3. If you can build up a large Frothing Berserker or Darius Crowley, aggro decks don’t tend to run much hard removal so they’ll be forced to trade multiple minions into it, or risk taking huge damage to their life total. 5. It’s wise to take more of a control approach throughout the game. If you can starve them of resources then your late game should significantly overpower theirs. 1. With no hard removal in the deck it’s tough for you to deal with single large minions. Sometimes it’s worth swinging in with multiple smaller minions to deal with the threat, or you may be better off trying to race the opponent down instead. 2. That said, Militia Commander is an excellent minion to use to trade up into stronger creatures, as she gains a bonus three attack the turn she enters the battlefield. 3. Don’t underestimate the power of your late game cards. The Lich King is a solid body with a handy bonus effect, Countess Ashmore represents efficient card draw, and Grommash Hellscream can offer surprise lethal damage. 4. Don’t over-commit too much on a single minion. Your 10 / 4 Frothing Berserker may look great, but the multiple removal options in control decks can eliminate him in a swift strike. Always leave something in reserve. 5. Even if you’re falling behind, Rush minions can get you back into the game quicker than you might expect – especially if paired with a buff from Akali, the Rhino. With Rush Warrior you’re hunting for your efficient early game minions during the Mulligan stage. 1. Prince Keleseth: The sooner this minion goes out into play, the more benefit you'll gain from your empowered minions over the course of the entire match. 2. Town Crier: A powerful Turn 1 play that immediately replaces itself - in your hand - with a Rush minion. 3. Eternium Rover: Antoher great early board contester that also provides extra Armor defense. 4. Frothing Berserker: If you've got earlier turns taken care of, this is another fantastic keep. In order to extract all the value offered up by Rush Warrior, you need to be familiar with every combo that powers it. Here's a complete breakdown of the biggest interactions that you need to be aware of when piloting this deck. - If you've any Rush minions left in your deck, Town Crier will grab one of them and pop it into your hand. - When Prince Keleseth is played, every minion remaining in your deck gains an extra +1 / +1 of stats. This provides huge value, and so you want to get this character out on the board as fast as you can. - Frothing Berserker gains one extra point of Attack each time a friendly minion takes damage. Cards like Blood Razor can be used to boost this character up neatly. - If your opponent destroys Mountainfire Armor on their turn, you'll receive six Armor as compensation. - The following minions all have the Rush keyword, which means they can attack other minions as soon as they're played: Rabid Worgen, Militia Commander, Zilliax, Darius Crowley and Akali, the Rhino. - Note that Militia Commander only gains increased Attack strength on the same turn she's played out onto the board. It isn't a permanent effect. - Similar to Rush, the following minions can attack all targets the moment they're put into play: Kor'kron Elite and Grommash Hellscream. - If Darius Crowley manages to kill an enemy minion and survive the encounter, he'll gain +2 / +2 of stats. - Once put into play, Mojomaster Zihi reduces both players' mana reserves to five. - Spirit of the Rhino will make your Rush minions Immune the turn they’re summoned - while it’s still in play - so use this effect to make trades while keeping your creatures alive. - When Akali, the Rhino deals enough damage to Overkill a creature, it’ll draw a Rush minion from your deck and buff it +5 / + 5, giving you a huge boost in stats for when you choose to play it. These are some of the most important cards in the Rush Warrior deck, as well as a few options for replacements if you’re missing some in your collection. Spirit of the Rhino: A new Rastakhan’s Rumble card that synergises brilliantly with all the Rush cards included in this deck to make them Immune the turn they are played. An invaluable effect. Town Crier: Helpful for digging through your deck to find important Rush minions buried deep within it. Prince Keleseth: You lose the ability to play Woodcutter’s Axe and Redband Wasp by running Prince Keleseth, but the sacrifice is well worth it for the buff effect on your entire deck of minions. Darius Crowley: Can grow out of control if you use him to trade with weaker minions and force some hard removal from your opponent. Zillax: A solid Rush minion that also gives the deck a bit of useful Lifesteal, among all the other handy keywords printed on the card! Not a must-have if you don’t have the dust for it though. Sul’thraze: You can find some serious value in this card by clearing off a lot of low health minions in a single turn. An Arcanite Reaper is an OK replacement if you’re missing this card. Countess Ashmore: Will draw you up to three cards, which is some terrific value along with the 6 / 6 body. If you don’t own her then try Shield Block for the draw if desperate. Akali, the Rhino: A big part of why this deck could be more viable in the latest expansion thanks to the big buff it can give to your Rush minions. Grommash Hellscream: A powerful finisher that can offer some surprise burst damage to your opponent. If you need another activator, you can swap a Whirlwind into the deck for Dyn-o-matic. Scourgelord Garrosh: A solid card to fill out the deck that also comes with a useful one damage whirlwind hero power for activating many card effects in the deck. The Lich King: A big body you can throw down on turn eight that demands a response from your opponent. Plus the additional spells you gain can be extremely useful. I've updated this guide with a much much better Tempo Warrior deck list. @Xentro I would just try and work in your stickiest mid to late game Deathrattle minion in there and see how you get on - try a few different ones out. It's tricky to be specific without seeing your collection. I just crafted N'zoth. I don't have enough dust left for cairne, any good replacement for the card or should I just not bother with this deck then? Was also thinking about Finley but i'm not sure he would be as efficient as in dragon warrior. Yeah I play one Arathi aswell and find it quite strong. It really helps when you don't draw your Fiery war axe, and you can often find ways to do a good trade on turn 4 with all the 1/2 damage spells you have in the deck, or just trade creatures better. I cut a fierce monkey to fill her in. @spriken2468 I've not tried the Arathi Weaponsmith version myself so can't really comment. I'll add that note about Varian as well - thanks! Oh, and also, in the Varian Wrynn section it may be helpful to add the fact that you do not want to end your turn before checking to see if Varian put any charge minions onto the battlefield--this has gotten me q couple of times. I've also found that Arathi Weapomsmith is really quite effective. Thoughts?